We have just had a beautiful weekend in Sydney to coincide with the annual Bass Sydney October bass catch. You can find out more about the bass catch here. The short version is that Bass Sydney runs a fishing event twice a year in the Hawkesbury/Nepean where all fish caught are recorded for lengths and place of capture and then the data is fed back to fisheries. My first two trips resulted in donuts and today looked like being the same. I hit the water in the bass kayak at around 3:30pm and decided my best chance was to flog the water with a jig spin. I used the ever reliable slider grub in blue and chartreuse, only for it to be anything but reliable! I did at least hook up after fishing about 500m of bank, but what felt like a decent fish threw the hook before I got a chance to see it. My first hookup of the season at least. Another successful trip to Yamba in mid winter, this time for my 50th birthday! As far as fishing goes, the star of the show was again the humble luderick. They were in full flight this trip with fish being caught over much of the lower river, particularly from "the peninsula" and "the middle wall". They were biting very freely on green weed and black, but plenty of others were catching them on cabbage as well. During our week there we mainly fished the middle wall from the boat. Its tricky to anchor and you must spend quality time doing this properly at the start of the session with a two anchor setup, a sand anchor out the back and a pick out the front on the wall itself. The run out from full seemed to present the best fishing. On two days the wind was blowing hard down the river from the west, so we tucked in behind Freeburn Island (at the end of the middle wall) and still caught plenty of fish on the rock wall there. 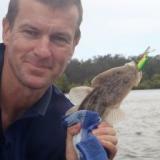 A sensational spring day but not great conditions for Luderick fishing. Low tide just as I arrived at 10:00 and crystal clear water typical of spring.